You may not have had the pleasure of seeing a Combined Effortsperformance. 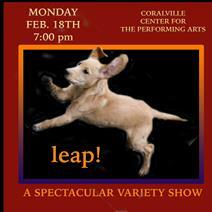 But on Monday, February 18th the company, founded in 2002, is bringing their talents to Coralville Center for Performing Arts. Catch this fast-paced variety show, which includes fabulous local talents together with Combined Efforts company members, in an evening of music, circus acts, comedy, and...dogs? Combined Efforts is Iowa’s only theatre company with a mission of purposeful inclusion: supporting gifted artists with disabilities. Performances celebrate artists and challenge perceptions. Tickets to this event are refundable up to 48 hours before the performance.